Foundation project: This study was financially supported by Ministry of Research, Technology and Higher Education, Republic of Indonesia (Research Contract No. 0668/K8/KM/2018). Since ancient times, people in various parts of the world have developed their own ways to prevent and treat diseases. In poor and developing countries, the most accessible treatment is traditional medicine. In these areas, native plants play an important role in the treatment of diseases. Traditional plant-based medicines (traditional herbal medicines) have been used to treat various diseases for thousands of years. Although modern medicine may be available in some communities, traditional herbal medicines still maintain their popularity. In recent years, using of plants for remedies continues increasing throughout the world. Most of the use of traditional herbal medicine was for historical and cultural reasons, and because it was relatively cheaper in cost. Many recent publications have reported various successes of traditional medicine. Traditional medicine has also become one of the most important things in searching of new potential compounds that can be developed as useful drugs for the treatment of various diseases. Malaria is an example of a classic infectious disease that has not been completely eradicated until now. Malaria is still the most deadly human parasitic infection in the world. The World Health Organization (WHO) reported that in 2015-2016, about half of the world’s population was at risk of malaria. The estimated number of malaria cases was 214-216 million, with 438 000-445 000 deaths due to this disease; a majority are children under five years old in the tropical and sub-tropical regions of the world. Most cases and deaths occur in sub-Saharan Africa, but some regions in Asia and America are also at risk. Until 2016, people in about 91 countries and regions had ongoing malaria transmission,. The continuous evolution of Plasmodium has increased its resistance to various antimalarial drugs that are widely used today. Several recent publications have even reported that Plasmodium falciparum has also shown an increase in resistance to artemisininbased antimalarials. Therefore, it is urgent to continue efforts of searching for new and more effective drugs. This prompted the researchers to find other alternative approach, such as evaluating medicinal plants. Some decades ago, plants were selected and screened randomly for their antimalarial activity. However, this approach was laborious, time-consuming, needed a high-level of investment and skill, and did not yield much result. A better approach used now is selecting plants that have been traditionally used by people to treat malaria. In many cases, this method has already accelerated the time of plants’ selection and test of its antimalarial activity, and saved more resources than the former approach. Research on medicinal plants of various traditional medicine systems could provide useful leads for the development of important active compounds. In addition, exploration of traditional medicine for malaria treatment is useful to design strategies that can be further developed to support a more effective and culturally acceptable malaria eliminating program. The Tetun community is one of the indigenous ethnics in Timor island. They mainly live in the central part of Timor, scattering in Indonesia (West Timor) and Republic Democratic Timor Leste (East Timor). In West Timor, they are scattered in all sub-districts in Belu and Malaka districts. In both areas, they live together with three other indigenous ethnic groups, namely Dawan (Pah Meto), Bunaq (Marae) and Kemak. The Tetun community was formed by indigenous people called Melus and migrants from the Malay Peninsula who came to Timor island in the past. In Belu and Malaka, this community have had a long time experience in using traditional plant-based medicines to treat various diseases. They called their traditional medicine ai tahan or kwa. Some old manuscripts from Catholic’s missionaries noted that since long time ago, local people of Timor were frequently attacked by malaria disease. So, it can be expected that the Tetun community has also developed useful strategies to fight malaria, including plant-based traditional medicine. This is the first study on local knowledge of the Tetun ethnic people about malaria and methods for the treatment of the disease that they have practiced for generations. Specifically, this study was intended to inventory and document the medicinal plants used by the Tetun people in their traditional medicine for the treatment of malaria. This research was carried out in the Belu and Malaka Districts [Figure 1]. Belu is located in the northern part of Timor island (9°150” S, 124°40’ E), and Malaka is in the south (9°34’ S, 124°54’ E). These two districts, together with Timor Tengah Utara (TTU) District, are three of Indonesian territories that border directly with the Republic Democratic Timor Leste. The study area includes fifteen villages of five sub-districts in Malaka (Kobalima Timur, Malaka Barat, Malaka Tengah, Weliman and Wewiku), and fourteen villages of ten sub-districts in Belu (Atambua Barat, Atambua Selatan, Kakuluk Mesak, Lamaknen, Lasiolat, Nanaet Duabesi, Raihat, Raimanuk, Tasifeto Barat and Tasifeto Timur). The study was conducted for nine months, from April to December 2017. The methods used to collect information in the field were interviews, focused group discussions and observations. Interviews were conducted with a semi-structured questionnaire. Questions were focused on the local knowledge about medicinal plants used for the treatment of malaria. Documentation of interview contents was carried out with hand-writing notes, and some of them were recorded by using an audio recorder. A total of 94 informants (43 men and 51 women) were involved in this study. Demographic profiles of the informants are listed in [Table 1]. Seventy-seven informants were interviewed one-on-one, and 17 were once interviewed in a focused group discussion. 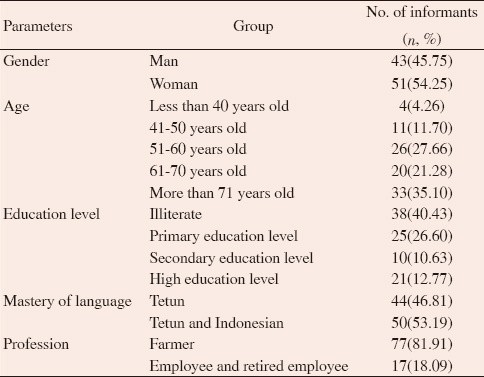 Table 1: Demographic profile of the informants (N=94). The informants were selected by purposive and snowball methods. They were people who had good knowledge and/or experiences in traditional medicine indicated by other local people. More than 50% of all informants were elderly people over the age of 50, with a low-level of education, or even illiterate. Most of the elderly informants who were illiterates live in the villages. Such informants can only speak local language – Tetun, while those who were younger and educated speak Tetun and Indonesian actively. About 80% of all informants were mainly farmers and housewives, and the rest were employees and retired employees. The informants’ knowledge of traditional medicinal plants was obtained in several ways, i.e. : (1) learning from parents as inheritance of family knowledge, (2) observing the traditional medical practices carried out by parents or traditional healers in the village, (3) experience of being ill and treated using traditional medicine, and (4) “taught by the ancestors” through dreams or visions. The data collected for each medicinal plant was the local name, the part (s) of plant used, and its mode of preparation and administration. Most of the plants were observed and collected in situ. Some short field walks were conducted with the informant(s) and/or local guide to collect sample of the plant(s) mentioned. Photographs of the plant(s) were taken and herbarium was prepared for scientific identification. Plants were first identified with the help of literature. Secondly, picture of each plant taken on the field was compared to the picture of the plant in various databases available online from some websites. The plants’ scientific name and taxonomic were also verified by the Indonesian Institute of Sciences (Lembaga Ilmu Pengetahuan Indonesia, LIPI)–Bogor Botanic Garden. Local knowledge information collected from fieldwork was analyzed to obtain the following data: (1) number of plants mentioned and botanical families, (2) most cited plants in every method of malaria treatment, (3) plants’ part(s) used in malaria treatment, and (4) mode of preparation and administration of medicine for the treatment of malaria. Quantitative analyses were also run to calculate the relative frequency of citation (RFC), that is the importance of each plant in the treatment of malaria. The RFC values was calculated using the following formula: RFC=Fc/N, where Fc was the number of informants who mentioned the use of the species, and N was the total number of informants. The RFC value is between 0-1. We recorded a total of 96 species of plants used by the Tetun people to treat malaria [Table 2]. The use of Cleome rutidosperma, Physalis angulata, Neoalsomitra podagrica and Fatoua pilosa as antimalarials were first reported in Indonesia. The 96 plants species belong to 41 families; the most frequent of which were Fabaceae (10 species), followed by Euphorbiaceae and Moraceae (6 species of each), and Apocynaceae, Myrtaceae, Rutaceae and Annonaceae (5 species of each). The plants were used in various modes of administration, i.e. : oral (50 species), massage (51 species), bath (48 species), inhalation (4 species), and cataplasm or poultice (7 species). Several plants were used in some different mode of administrations. Table 2: Plants used in Tetun ethnics’ traditional medicine for malaria treatment. More than 70% of plants (72 species) were wild, collected from forest near the village. Some of the medicinal plants like Acorus calamus, Allium sativum, Allium cepa, Capsicum annuum, Ocimum basillicum, Piper betle (P. betle), Ruta angustifolia, Solanum lycopersicum and Zingiber officinale were grown by people in their home yards. Allium sativum and Allium cepa usually obtained from traditional markets or home yards. The leaves (59 species), bark (23 species) and roots (15 species) were the three parts of the plant that most widely used in various formulas for the treatment of malaria. Processing of plants used as medicine was carried out very simply. Decoction of the whole or crushed plants’part was the most common method of preparation. The other methods were to crush single or mixture of plants’ part(s) into a paste for massage or cataplasm, soak or boil for bath, and boil for inhalation. The medicine formula for oral use, bath and inhalation was generally prepared in the form of a mixture of several different plant ingredients. People believe that mixture of plants can enhance the efficacy of the remedies. Some bitter-tasted plants as Strychnos ligustrina, Carica papaya, Melia azedarach, Momordica sp. and Alstonia scholaris were also suggested by elderly people as for malaria prevention. Some of plants used in the treatment of malaria were traditionally classified by the Tetun people as cold plants and hot plants. Drynaria quercifolia and Crinum asiaticum were classified as cold plants, while Ruta angustifolia, Ocimum basillicum, Ocimum americanum, Capsicum annuum, Zingiber officinale, Piper cubeba, P. betle and Acorus calamus were considered hot plants. According to the RFC values, Strychnos ligustrina (RFC=0.34), Calotropis gigantea (RFC=0.25), Cleome rutidosperma (RFC=0.18), Physalis angulata (RFC=0.18), Alstonia spectabilis (RFC=0.17), Carica papaya (RFC=0.17), Melia azedarach (RFC=0.14) and Alstonia scholaris (RFC=0.14) were the most widely used in various medicinal ingredients for oral administration. Jatropha curcas (RFC=0.31), Garuga floribunda (RFC=0.26), Calotropis gigantea (RFC=0.23) and Cleome rutidosperma (RFC=0.20) were widely used for massage. Tamarindus indica (RFC=0.26) was the most widely used for bathing. Annona reticulata (RFC=0.02) and Moringa oleifera (RFC=0.03) were most used to prepare ingredients for inhalation and cataplasm, respectively. Almost all the plants in medicines for oral administration are bitter plants. Many studies have proven that bitter plants contain various plants’ secondary metabolites of alkaloids, terpenoids, flavonoids that are active as direct antimalarials (antiplasmodial) and/or indirect antimalarials (antipyretic, anti-inflammatory, analgesic, immunostimulant, hemolytic, and membrane modifier). Several previous studies have shown that some of the medicinal plants documented in this study do have pharmacological activities related to malaria such as antiplasmodial, antipyretic, anti-inflammatory, and analgesic. The most widely used plants in oral ingredients -Strychnos ligustrina, Calotropis gigantea, Cleome rutidosperma, Physalis angulata, Alstonia spectabilis, Carica papaya, Melia azedarach and Alstonia scholaris have been known to have one or more of these activities-antipyretic, anti-inflammatory, and analgesic, in addition to their antiplasmodial activity. Some of bitter-tasted plants like Carica papaya, Melia azedarach, Momordica sp. and Alstonia scholaris which were suggested by elderly people to prevent malaria also have pharmacological activity as immunostimulant,,,,,,,. Plants which claimed to be cold plants such as Drynaria quercifolia and Crinum asiaticum generally have a high content of water in the part used for the treatment of malaria, so, they can act as good heat absorber. The cold plants absorb the excess heat from the body so that the body temperature drops to normal again. On the other hand, hot plants like Ruta angustifolia, Ocimum basillicum, Ocimum americanum, Capsicum annuum, Zingiber officinale, Piper cubeba, P. betle and Acorus calamus contain essential oils, which have a spicy taste on the tongue, or heat sensation when exposed to skin. These hot plants act to increase body temperature and promote sweat production, so the body temperature decreases to normal again. Some compounds in essential oils of these plants, for example of Ocimum sp., are monoterpenoids such as linalool, methyl chavicol, thymol, eugenol, ocimen, limonen, geraniol, cineol, estragol and cariophyllene, which were known to have various pharmacological activities. The Tetun people believed that wild or non-cultivated plants were more effective than cultivated plants. The reason was that wild plants were able to survive without protection and maintenance by humans. The cultivated plants were considered to have no healing power compared with plants collected from the wild. This kind of view was actually a tradition. However, as plant was considered a diluted drug, the healing power in question was certainly closely related to the content of pharmacological active substances in it. The formation of active metabolites such as terpenoids, flavonoids and alkaloids in plants of same species varies greatly, influenced by differences in environmental stresses faced by each plant, such as temperature, light intensity, and attack of herbivores or microbes. Stronger environmental stresses could even affect in genetics or protein levels, producing different types of metabolites. In general, the non-cultivated plants experienced greater environmental stresses, and stimulated them to produce some different in type and abundance of secondary metabolites than the cultivated ones. The differences may result in more active pharmacologycal properties. The practice of traditional medicine in the Tetun community has been existing for a long time, verbally passed from one generation to the next generation. There were no written documents about their local wisdom. Knowledge of traditional medicine still persists among the elderly, and was increasingly lost among young people. Just like in many other societies, this practice of traditional medicine was slowly being abandoned by people. It was especially because of the expansion of the more practical modern medicines, and the assumption of young people that the practice of traditional medicine was primitive. A total of 96 plants species of 41 families were documented as medicinal plants for malaria treatment by indigenous people of Belu and Malaka Districts in West Timor Indonesia. These newly collected plants are a precious source for the future development of new drugs and strategies to improve malaria eliminating programs. In recent years, indigenous knowledge and traditional experiences continued disappearing(have been disappearing). Therefore, it is important to conduct ethnomedicine researches like this to document the valuable knowledge before they disappear from the community. We fully acknowledged all the informants for participating the surveys and sharing their knowledge with us. We also thank Father Rector of Widya Mandira Catholic University, and Head of Yayasan Pendidikan Katolik Arnoldus for their support to conducted this research in field. This study was financially supported by Ministry of Research, Technology and Higher Education, Republic of Indonesia (Research Contract No. 0668/K8/KM/2018). Falodun A, Imieje V, Erharuyi O, Joy A, Langer P, Jacob M, et al. Isolation of antileishmanial, antimalarial and antimicrobial metabolites from Jatropha multifida. Asian Pac J Trop Biomed 2014; 4(5): 374-378. Willcox ML, Bodeker G. Traditional herbal medicines for malaria. Br Med J 2004; 329: 1156-1159. World Health Organization. World malaria report 2015. Geneva: WHO Press. 2015. World Health Organization. World malaria report 2017. Geneva: WHO Press. 2017. Htut ZW. Artemisinin resistance in Plasmodium falciparum malaria. N Engl J Med 2009; 361: 1807-1808. Christian AG, Ahunna AG, Nwakaego EM, Chimsorom CK, Chile AE. Antimalarial potential of the ethanolic leaf extract of Pseudocedrala kotschyi. J Acute Dis 2015; 5: 23-27. Lemma MT, Ahmed AM, Elhady MT, Ngo HT, Vu TL, Sang TK, et al. Medicinal plants for in vitro antiplasmodial activities: A systematic review of literature. Parasitol Int 2017; 66(6): 713-720. Serengbe GB, Moyen JM, Fioboy R, Beyam EN, Kango C, Bangue C, et al. Knowledge and perceptions about malaria in communities in four districts of the Central African Republic. BMC Res Notes 2015; 8: 162. Seran HJ. Ema Tetun. Kupang: Penerbit Gita Kasih; 2007, p. 30-32. Taek MM, Mali S. Plants in ai tahan: traditional medicine of the Tetun ethnic community in West Timor Indonesia. In: Proc 7th Annual Basic Science Int Conf. Malang: Brawijaya University; 2017, p. 71-76. Embuiru H. Sejarah Gereja Katolik di Timor. Jilid 2. Ende: Penerbit Nusa Indah; 1998, p.43-45. Drees EM. List of tree and shrub names from Timor. Bogor: Balai Penyelidikan Kehutanan; 1950, p.20-24. Agbodeka K, Gbekley HE, Karou SD, Anani K, Agbonon A, Tchacondo T. Ethnobotanical study of medicinal plants used for the treatment of malaria in the plateau region, Togo. Pharmacognosy Res 2016; 8(1): S12-S8. Mambu L, Grellier P. Antimalarial compounds from traditionally used medicinal plants. In: Colegate SM, Molyneux RJ (eds.). Bioactive natural products: Detection, isolation and structural determination. 2nd edition. New York: CRC Press; 2007. Trimurningsih T, Subeki S, Matsuura H, Takahashi K, Yamasaki M, Yamato O. Evaluation of the inhibitory activities of the extracts of Indonesian traditional medicinal plants against Plasmodium falciparum and Babesia gibsoni. J Vet Med Sci 2005; 67: 829-831. Yogiraj V, Goyal PK, Chauhan CS, Goyal A, Vyas B. Carica papaya Linn: An overview. Int J Herb Med 2014; 2(5): 1-8. Azam MM, Mamun-Or-Rashid ANM, Towfique NM, Sen MK, Nasrin S. Pharmacological potentials of Melia azedarach L: A review. Am J BioSci 2013; 1(2): 44-49. Anilakumar KR, Kumar GP, Ilaiyaraja N. Nutritional, pharmacological and medicinal properties of Momordica charantia. Int J Nutr Food Sci 2015; 4(1): 75-83. Dey A. Alstonia scholaris R.Br. (Apocynaceae), phytochemistry and pharmacology: A concise review. J Appl Pharm Sci 2011; 1(6): 51-57. Chan EW, Wong SK, Chan HT. Apocynaceae species with antiproliferative and/or antiplasmodial properties: A review of ten genera. J Integr Med 2016; 14(4): 269-284. Sun CP, Oppong MB, Zhao F, Chen LX, Qiu F. Unprecedented 22,26-seco physalins from Physalis angulata and their anti-inflammatory potential. Org Biomol Chem 2017; 15(41): 8700-8704. Bose A, Smith PJ, Lategan CA, Gupta JK, Si S. Studies on in vitro antiplasmodial activity of Cleome rutidosperma. Acta Pol Pharm 2010; 67(3): 315-318. Pandey AK, Singh P, Tripathi NN. Chemistry and bioactivities of essential oils of some Ocimum species: An overview. Asian Pac J Trop Biomed 2014; 4(9): 682-694. Schippmann U, Leaman DJ, Cunningham AB. Impact of cultivation and gathering of medicinal plants on biodiversity: Global trends and issues. Rome: FAO; 2002. Awang DVC. Tyler’s herbs of choice, the therapeutic use of phytomedicinals. 3rd ed. New York: CRC Press; 2009. Holopainen JK, Gershenzon J. Multiple stress factors and the emission of plant VOCs. Trends Plant Sci 2010; 15: 176-184. Loreto F, Schnitzler JP. Abiotic stresses and induced biogenic volatile organic compounds. Trends Plant Sci 2010; 15: 154-166. Ncube B, Finnie JF, Staden JV. Quality from the field: The impact of environmental factors as quality determinants in medicinal plants. South Afr J Bot 2012; 82: 11-20. Abdullahi AA. Trends and challenges of traditional medicine in Africa. Afr J Tradit Complement Altern Med 2011; 8(5): 115-123.